The strange thing would be not to remember this popular song if we talk about Rianxo. A small coastal town in the province of A Coruña which, among other things, was the cradle of authors of great relevance for Galician literature. Manuel Antonio, Rafael Dieste and, above all, Alfonso Daniel Rodríguez Castelao, are the names that place this locality on the map. Of course, this is not the only thing that stands out, as Rianxo has an enormous historical heritage such as the gold helmet (or bowl) that can be found in the Provincial Archaeological Museum or the ruins of an ancient castle -possibly- built by Paio Gómez Charino in the 13th century that still preserves, today, the magic of a love story truncated by the Templar Knights. Although there is not much information about this fortress, it is known that it belonged to the Order of the Temple and then passed to the Mitra Compostelana. Since then, between demolitions and reconstructions, the one known as Castelo da Lúa has remained in a state of ruin since approximately 1532. And although some of the materials that made up the fort were reused in the construction of the church of Santa Comba de Rianxo, at present little trace remains of this defensive structure. When the castle belonged to the Order of the Temple, between one of the many fights and confrontations with the old feudal lord owner, the knights manage to kidnap their daughter. By chance, one of the knights at the disposal of the old feudal lord was also held at that moment. He had been imprisoned after defending the honor of the lord and the girl, with whom he was deeply in love. Throughout the imprisonment, according to legend, the girl devoted all her time to look after the badly wounded knight, thus awakening the compassion of the Templar in charge of watching over her stay in the fortress. Until finally one night, with the help of the ‘guard’, the lovers managed to escape through the passageways that led to the beach, where a boat awaited them. In the attempt to escape, the Templar military sounded the alarm and, while the knight tried to protect with the body of his beloved, began to shoot the arrows hitting the chest of the young man, who died in the act. The next day, the bodies of the two boys appeared embraced on the shore, after their boat capsized. Since then, every night, the rays of moonlight illuminate and watch over the burial of the lovers buried there by the Templars. Today, remembering and recreating history is simple. 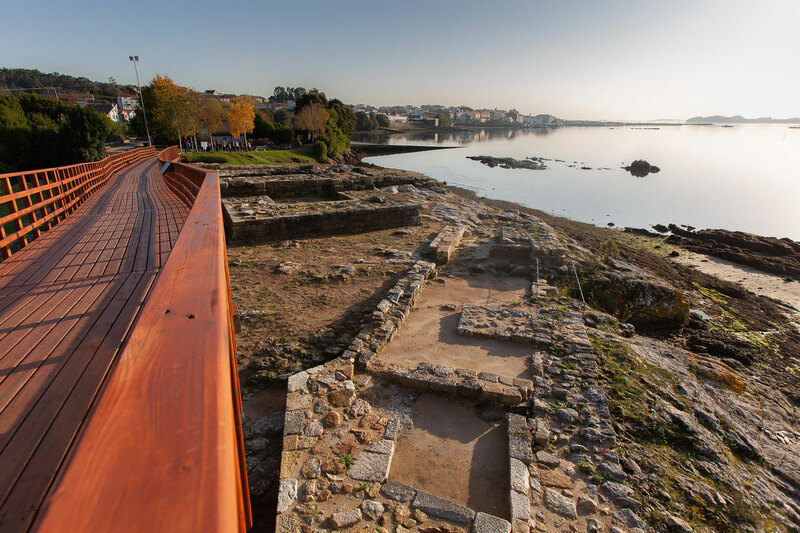 In our visit to Rianxo, we can start by walking along the sandy beach A Torre, reach the Park of the beach A Torre and take a look at the sculpture in honor of Xosé María Brea Segade and finally, cross the river Te thanks to the wooden footbridge that brings us to the ruins of the castle.